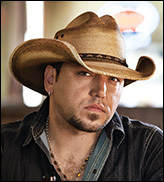 (Hypebot) – Country music superstar Jason Aldean was performing on stage when shots rang out at the Route 91 Harvest Festival in Las Vegas leaving 59 dead and more than 500 wounded on Sunday night. Hours after the event Aldean posted briefly on Instagram. Now, he's followed with a full and seemingly heartfelt statement. "Over the last 24 hrs I have gone through lots of emotions. Fear, Anger, Heartache, Compassion and many others. I truely dont [sic] understand why a person would want to take the life of another. Something has changed in this country and in this world lately that is scary to see, he wrote in an Instagram post. "This world is becoming the kind of place i am afraid to raise my children in," he continued. "At the end of the day we aren't Democrats or Republicans, Whites or Blacks, Men or Women. We are all humans and we are all Americans and its time to start acting like it and stand together as ONE! That is the only way we will ever get this Country to be better than it has ever been, but we have a long way to go and we have to start now. My heart aches for the Victims and their families of this Senseless act. I am so sorry for the hurt and pain everyone is feeling right now and there are no words i can say to to take that pain away. Just know u all are in my heart and my prayers as we all go through this together. Time to come together and stop the hate! #stopthehate #prayforlasvegas "